Nothing is permanent, not even loneliness. Where there is hope, there is always possibility—the possibility of love and the possibility of friendship. Pandora, a picture book written and illustrated by Victoria Turnbull, is a book about hope. Pandora, the main character, lives alone in what looks like a junkyard full of broken and forgotten objects. Pandora’s heart, however, is not vanquished by her lonely and barren existence. She makes a cozy home and goes about sewing abandoned teddy bears and making wind chimes out of old glass bottles. One day, a little injured blue bird falls outside her window and Pandora’s life begins to change. She not only makes a friend, her generosity ends up bringing her a whole new world full of life that she never expected. 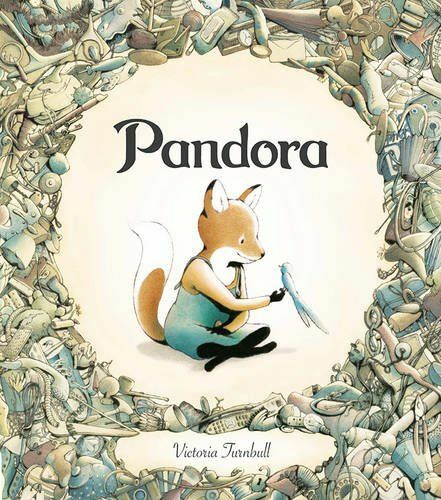 The book jacket says Pandora is about “renewal and the power of hope, friendship, and nature”. I agree, but I would like to add that it is about the magic that can be reaped by sowing genuine hope and friendship even when it might seem pointless. At first, Pandora and the blue bird bring the only color to the surroundings, but that changes as the little blue bird’s tiny gifts begin to bear fruit.